All ingenious things are simple and inexpensive, thus it is not possible to make money selling them. Here is one of them: If you simply sip hot water throughout the day you will notice that your digestive system is purified and strengthened, your body – detoxified and rejuvenated. Undigested, unabsorbed food or emotion turns into ama – a toxic, sticky, foul-smelling substance. Disease is actually a crisis of ama, in which the body seeks to eliminate the accumulated toxicity. Two things we can do are: prevent the buildup of ama and eliminate it in case the toxins have accumulated in our body. Hot water can dissolve toxins from our system just as it dissolves grease from dirty surfaces. Another thing that hot water does is cook the undigested remnants just like food is cooked to make it more digestible. To digest something one needs the energy of fire (pitta). We add it by cooking food on the stove. Two respected Ayurvedic authors – Deepak Chopra and Dr. John Douillard – emphasize the importance of taking hot water to strengthen and maintain health and even to lose weight. “Drinking plain boiled hot water is an ancient Ayurvedic method for flushing the lymphatic system, softening hardened tissues, and dilating, cleansing and then hydrating deep tissues. It also heals and repairs the digestive system and flushes the GALT (lymph on the outside of the intestinal wall)” (John Douillard). Remember that any liquids other than pure water do not count, they are considered food in Ayurveda. During the first few weeks you may go to the bathroom more often. This is because the body is beginning to flush out toxins. Gradually everything should return to normal, but the ama will continue to be released from the body. Ayurveda does not recommend cold drinks at any time, because it is shocking to the system and can extinguish the digestive fire. Not all times of day are equally good for consuming hot water because our kidneys, just as every other organ, have their periods of activity and passivity. 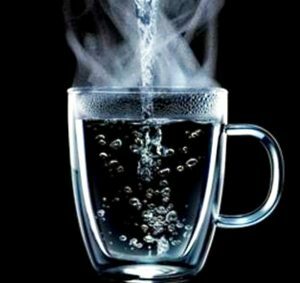 It is very beneficial to have a glass or two of warm water first thing in the morning, especially when constipation is the case. Ayurveda suggests that forty percent of all water be consumed before breakfast and another forty percent by 4 pm. Have the last twenty percent before 7 pm and give your kidneys a rest until the next morning. The water should be comfortably hot but not scalding. Of course, this is just a general guideline and if you are thirsty in the evening or at night you can have some sips of water. However, if you are thirsty all the time, then your metabolism is not running correctly. You should see your health care (Ayurvedic) provider. TODAY’S TIP: Coffee, tea, soft drinks, and alcohol are all damaging to kidney function and to water metabolism. Soft drinks rob the body of precious minerals and destroy the absorption of water and should not be consumed at all (see also Junk food and Ayurveda). Clean water, pure fresh fruit or vegetable juices (better diluted with warm water), or herbal teas are the best options.